This is the story of election night 2016 in the words of more than 20 journalists who were in the field, in the newsrooms, at the anchor desks, and in the control rooms. The story of how Donald Trump's stunning win was covered in real time. On Tuesday, November 8, "Donald Trump elected president" graphics and gizmos were ready, just in case, but few expected to use them. "We went into the night knowing there was a chance Trump could win," PBS "NewsHour" anchor Judy Woodruff said. "But all the smart people said it was not going to happen." It wasn't just pollsters, pundits and political whizzes who were assuming Hillary Clinton would cruise to victory -- it was Republican bigwigs and Trump campaign staffers, too. In the days leading up to Tuesday, "I was talking with people on both campaigns and I was getting the same prediction from Team Trump that I was getting from Team Clinton -- which was that Hillary would end up with a few more than 300 electoral votes," CNBC anchor and New York Times columnist John Harwood said. CBS political director and "Face the Nation" moderator John Dickerson said he had "senior Republicans in the Senate calling me the day before the election saying, 'Here are the things Hillary Clinton is going to have to do to reach out to Republicans.' The premise was that she was going to win." Conservative radio talk show host Hugh Hewitt, who voted for Trump, thought he voted for the loser. "I didn't see it coming. Anybody who says they did, I think they're lying," he said. Pulitzer winning photographer David Hume Kennerly, working for CNN on election night, had sought behind-the-scenes access to Trump and his family for election night. There are iconic photos of past presidents watching and waiting for the results. But the Trump campaign declined his requests for access. Kennerly guessed it was because "they weren't sure they were going to win." "We had really lobbied to get me in there, to document history, one way or the other," he said. "It's too bad, because I think it was a major historical opportunity lost." So Kennerly waited for Trump inside the campaign party at the Hilton in midtown Manhattan. Within a one-mile radius were most of the major networks' election night studios; big newsrooms like The New York Times; and Clinton's party venue. Reporters by and large were ready for the 2016 race to be over. And yet, as "Fox News Sunday" moderator Chris Wallace pointed out, "There's nothing more exciting for a political reporter than when things go off-script." Washington Post reporter Abby D. Phillip: "If there was any campaign that was going to have a really shocking surprise, it was going to be this one." Annie Linskey of The Boston Globe arrived at the Clinton campaign's planned victory party at the Javits Center. Linskey and her colleague Matt Viser had written "Clinton wins" and "Trump wins" drafts of the next day's story. Linskey: "When I got there, the Clinton people were just so happy. The biggest smiles." The campaign made it difficult for reporters to talk with supporters -- barriers and event staffers separated the two groups. But Linskey sought some "color" for her pre-written story. Linskey: "All I needed were two or three happy quotes. Just a little graf of happiness, because we assumed she was going to win." Hugh Hewitt was at NBC and MSNBC's election HQ, watching as Trump campaign manager Kellyanne Conway told Chuck Todd that "we didn't have the full support of the Republican infrastructure." Hewitt: "We thought she sounded like someone who was not expecting to win." Sopan Deb, a CBS News producer who was embedded with Trump's campaign from the beginning, was at the Trump party at the Hilton. Deb: "There were questions, even among people in the room, as to whether Trump would even show up if he lost." The five major networks and the Associated Press are conducting exit polling across the country. David Chalian, political director for CNN: "Prior to 5 p.m., only people who are in a quarantine room all day long can see the data." At 5, the embargo lifted, and at CNN there was a 5:15 meeting to discuss the findings. CNN D.C. Bureau Chief Sam Feist: In a "change from tradition," CNN's election night anchors, analysts and reporters did not attend the meeting. "We wanted them to react in real time" to the actual vote counts. David Chalian: The headline from the exit polls was "advantage Clinton, with the major caveat that we need more interviews to come in... We definitely left with the notion that it was going to be a long night, not a quick, easy night." Chris Wallace was at Fox News HQ in New York for a similar meeting. Wallace: "We were all around this long table, Rupert at the head of the table, and all of the producers and anchors on both sides of it. They gave us the first wave of exit polls. While it didn't flat out say Clinton was going to win, if you read it, you had to think Clinton was going to win." John Harwood and the CNBC team listened into NBC's exit poll call. Harwood: "The money phrase was something like, 'I could see a path for Clinton that's just barely to 270 and I can see a path that's well over 270.'" Carolyn Ryan, politics editor at The New York Times: "There was a kind of electricity in the building. Lots of people in the newsroom. Everybody taking pictures. Some people brought their family and kids, because it was going to be a historic night." Special reports are already well underway on cable. Now the broadcast networks are also on the air. John Dickerson: "The exit polls didn't show a big lead for her, but they showed a little bit of a lead. What I was wondering was: Will we get an answer tonight?" Polls close in most of Florida and several other states. Maria Elena Salinas was anchoring Univision's coverage alongside Jorge Ramos. Salinas: "Our headline the day before was, 'Hillary will win Florida.' Not 'Hillary might win Florida.'" The headline was based on a data company's statistical forecast on the final weekend of election day. The forecast anticipated that the Latino vote "would carry Clinton to victory." Elections analyst Nate Cohn and his colleagues at The New York Times' Upshot web site introduced a "live presidential forecast." Cohn: "We had a model that estimated how every county in the country was going to vote. The forecast was comparing the actual results to what we expected to happen." The model showed Clinton with an 85% chance of winning. On CNN, Jim Acosta, reporting from Trump HQ, shared what a senior advisor to Trump told him: "It will take a miracle for us to win." And then the votes started pouring in. Nate Cohn: "We learned about the night in two steps. First was the Florida early vote. It just didn't come in for Clinton like we thought it would." Dana Bash was in the CNN studio with Wolf Blitzer, John King, Jake Tapper, and Anderson Cooper. Bash: "As soon as we started seeing Florida 'off,' we started saying, 'Oh, OK.'"
John Dickerson: "The Clinton people and people aligned with Clinton had been saying 'We're turning out a massive Latino vote in Florida,' but reality was not matching their boasts. It was the first sign of the evening. I thought, 'If their boasts about how well they were doing in Florida were off, they might be off in other places.'" More than half the Florida votes were in. The panhandle counties were set to close at 8. "Another presidential race where all eyes right now are on Florida," Blitzer said on CNN. 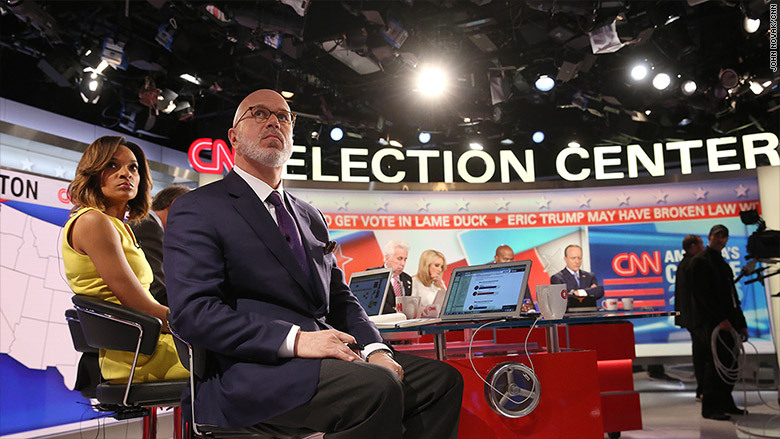 CNN president Jeff Zucker was in the control room alongside Feist and executive producer Eric Sherling. David Chalian: "Jeff made the decision late in the 7 o'clock hour... In his mind, the story was about one thing and one thing only, who was winning Florida, go to John King for that." King's "magic wall," first used in 2008 to display election data, was an essential tool again in 2016. King stood at the wall for hours zooming in on specific counties and studying the vote counts for Clinton and Trump. It was one of the defining images of the night. Sam Feist: "Our philosophy was, the vote results are far more interesting than a conversation about the vote results." Time's D.C. bureau chief Michael Scherer was watching the coverage while preparing a special election edition of the magazine. The print deadline was less than 24 hours away. Scherer: "The assumption was that, once Florida started behaving differently, that that was going to continue." Maria Elena Salinas: "Our Democratic pollster started saying, 'It's not looking good. It's not looking good.'" John Dickerson: "I just remember a period of -- just -- there just was not clarity." It wasn't just Florida. North Carolina was also too close to call. Sopan Deb: "A lot of the journalists started wondering if we were in for a shocker." The Times' live forecast showed Clinton's chances eroding, from 85% to 80% to 75%. Carolyn Ryan: "I started feeling like there was something happening between 8 and 8:30." Chris Wallace studied the East Coast results from his perch at the Fox News studio. Wallace: "The sweep that the exit polls had predicted just wasn't happening. Now we were down to counting individual votes." Sam Feist: "This was going to be a state by state battle." Carolyn Ryan: "Amy Chozick, our Clinton reporter, told me, 'People on the Clinton campaign who don't even smoke are outside smoking. There's this crazy nervousness.'" The New York Times held a ticketed event at its conference center for political junkies who wanted to spend election night with Times reporters and columnists. Carolyn Ryan: "I went down to the Times Center to talk to this group, it was probably 400 people, and they had been in this bubble for a few hours. I said, 'Florida's looking very uncertain for Clinton.' They just gasped." Judy Woodruff: "By 9 o'clock, we knew something was 'off' with the prediction." Nate Cohn: "There's definitely this moment around 9 p.m. ..."
David Chalian: "I started texting some folks saying, 'This is going to be an astonishing evening.'" Polls are now closed in more than a dozen states. There were no immediate calls in states like Michigan or Wisconsin. Chris Wallace factored that in as, on-air at 9:05, he told Megyn Kelly that he was becoming "open to the possibility that Donald Trump could be the next President of the United States." His voice betrayed his own amazement at the words. It was a pivotal moment in the coverage of the night. He'd said aloud what others had until then been saying only to themselves. Wallace: "I'm kind of proud of it, in the sense that it altered our coverage a little bit." Fox had used the occasion of election night to debut a brand new street-level studio five blocks from the Hilton. Monitors were placed outside. When Wallace said Trump could be president, he could hear the crowd start to cheer. Wallace: "I turned around toward them and said, 'I'm not saying he's going to win, folks, but it's possible.'" John Dickerson: "We knew something was going on here, but we didn't know what it was." Nate Cohn: "We were on the second floor at the Times, in the sports conference room. I think I said something to the room like, 'Gun to my head, Trump's got this.' And then I said, 'Can I tweet it?'" Cohn's colleagues said no. Better to be cautious. So he tweeted cryptically: "This is going to be a long night." David Chalian: "By 9:15, I think I said to my producer Terence Burlij, 'Trump may win this thing.' He looked at me like I was crazy. You could sense that the night was different." Nate Cohn commented on Twitter that "the early Wisconsin results — perhaps unrepresentative — are all great for Trump." Cohn: "THAT'S when I started writing my Trump-wins piece." At the Javits Center, Abby D. Phillip had been interviewing Clinton aides on camera for the Post's live webcast. One of them, Zerlina Maxwell, was scheduled for a 9:30 interview. Phillip: "Maxwell was physically there at the live shot location. She was on her phone. She looked up and said, 'I can't do this.' That's when things were starting to look very, very iffy for them in a number of states. When they canceled that hit, I realized, this is pretty serious." Phillip walked to the event hall to look for Clinton aides. There was no one. At Time magazine, it was rewrite time. Michael Scherer: "It wasn't as if we had written off the possibility that Trump could win. We had stories prepared. We had outlines. We had reporting. We were prepared to do it. But in terms of our preparation for the magazine, we were definitely leaning into a Clinton win." So he held a conference call with his reporters in New York and DC. Scherer: "We basically got on the phone and said, 'Something is happening here, something we didn't see coming. We have to shift what we're doing.'" Nate Cohn tweeted, "This is a true toss-up." His live forecast, based on real-time vote count, showed Clinton and Trump each with a 50% chance of winning. Trump takes the lead in Cohn's forecast. Amanda Carpenter, a Ted Cruz aide turned CNN commentator, was in a CNN green room in D.C.
Carpenter: "I was watching The New York Times ticker go wildly. I would walk away and go breathe and say, 'Is this really happening?'" Nate Cohn: "People I haven't heard from in years were texting me, 'Is it going to be all right?'" David Chalian: "My phone was blowing up. Two types of questions. 'Why haven't you called X?' And astonished sources on both sides being like, 'What is going on?'" Nate Cohn: "I turned off my phone. I still haven't looked at my texts." On Breitbart's live blog, Joel Pollak writes that the mood at the Trump party has "brightened." Chris Wallace, Fox News: "This was absolutely up for grabs." John Dickerson: "We knew it was going Trump's way. The question was where, and why." Judy Woodruff: "We had a news story on our hands. A huge news story!" Trump's improving chances trigger a market selloff. Dow Futures are down 500 points. TV control rooms queue up their market graphics. John Harwood: "We started to see the Dow futures drop dramatically. And we thought, 'Holy crap, we're in a different world.'" Judy Woodruff: "Michigan and Wisconsin had closed and she was having trouble in both of those states. The question now was: 'Is Hillary going to be able to pull it off?'" The Times' live forecast showed Trump's chances continuing to improve. Hugh Hewitt: "From that moment on, from the moment The Upshot went to 55%, 60% likelihood of Trump winning, everyone realized, 'Wow.' I showed my phone to James Carville, and James saw it and immediately knew it was over." But people were still voting out west. And models are no match for raw vote counting. Hewitt: "Even as all the red lights are going on, signaling upset Trump win, stunning election, people don't want to say it until it's absolutely locked down. They know the consequences." Maria Elena Salinas: "One word: Adrenaline." Dana Bash: "It is the ultimate adrenaline rush. The ultimate." John Dickerson: "This really interesting thing is happening. Can you be the first one to put your finger on why?" Annie Linskey was still reporting from Clinton HQ. Linskey: "I was probably the last person to know that Clinton was going to lose. Because in this bubble, there was constant reassurance coming from the campaign -- 'don't worry.'" Her bosses, watching TV back in the Boston Globe newsroom, knew differently. Linskey: "My editor said, 'We need to get the Trump-wins story in better shape.'" In the Times newsroom, Carolyn Ryan worked with reporters to rejigger their stories too. Ryan: "Just how unusual a political figure he was. And just how unusual a political moment this was. THAT'S what we needed to convey somehow." Ryan Grim, D.C. bureau chief, The Huffington Post: "Somebody did ask, I forget who it was, 'Do we even have pre-writes for all this?' We did. They were not the stories we were expecting to publish, that's for sure. We were certainly glad we had them." Amanda Carpenter: "I had a column written saying, 'Tonight was like a roller coaster. But it all landed as expected, safely, as everyone predicted.' Delete, delete, delete." John Harwood emailed a senior Obama aide -- a trusted source with campaign experience. "Think she still wins?" The source replied: "Yes. Tight." Abby D. Phillip, reporting from the Clinton event: "People in the crowd were starting to drink more." At the Trump event, the bars were busy too, but for different reasons. Susan Swain, president of C-SPAN, which showed a split screen of the two parties: "In TV terms, those two scenes were perfect for C-SPAN -- no commentary was necessary. The faces said more than any words could." Judy Woodruff: "We were collectively realizing what was happening." Behind the scenes at NBC, in between his live shots, Hugh Hewitt kept to himself. Hewitt: "Nobody was very chatty. People were so stunned. [But] everything was very professional. Even people who -- I don't know their politics, but I assume they might've been Democrats -- said not one unprofessional word." Associated Press executive editor Kathleen Carroll was at the D.C. bureau: "There was not the shock that I've heard other people describe. There was a dawning realization that it was going to go his way." Sam Feist in the CNN D.C. control room: "On election nights, we're in touch with both campaigns. There are times when we check in to see if there's something they're seeing that we're not seeing." Feist said the Clinton and Trump teams never spun him or fed false information. Feist: "At one point I asked the Clinton camp, 'Is there something you're seeing in North Carolina that we're not seeing? Because I don't see how you win it.' The answer was 'Nope, we're not seeing anything. We're going to lose the state.'" CNN projected Trump's win in North Carolina at 11:08. Was there still a way forward for Clinton? Her aides continued to say yes. CNN's Jeff Zeleny emailed his latest reporting to Feist and other colleagues: "They still believe Clinton can -- and will -- win. But by the narrowest of paths, just above 270." Annie Linskey emailed a top Clinton aide: "Any intel you guys can share?" The aide replied: "Wisconsin still out: All of Madison. All of Milwaukee. Michigan: All of Detroit still out. Ann Arbor not in either. The upper Midwest firewall can still hold as intended." Linskey was skeptical. While none of the networks were ready to call any of the key Rust Belt states, Trump had clear advantages in each of them. Kellyanne Conway tweets, "STOP saying ALL pollsters missed it." John Dickerson: "Wisconsin was closer than you would have guessed... I thought, if Wisconsin's gone, then Pennsylvania's gone and maybe Michigan's gone." C-SPAN political editor Steve Scully: "I kept thinking about the 'experts,' 'polling models' and 'predictions' that Trump was going to lose. The numbers, however, clearly said something different." Fox becomes the first network to call Wisconsin for Trump. John Harwood: "It was a gradual realization. It wasn't fully realized I think until 11 or midnight -- when it was like, 'Wow, she IS going to lose.'" At the Javits Center, there were tears in the eyes of some Clinton supporters. The event staffers charged with keeping reporters from Clinton supporters melted away. Annie Linskey: "It was much easier, all of a sudden, to get people to talk." Abby D. Phillip: "That was the most visible manifestation of the breakdown of the night." Linskey: "People were saying these incredibly quotable things. The passion that came out for her losing seemed much stronger, even that night, than any excitement about her winning." Susan Swain: "You could watch the story unfold on the faces. And late in the evening the emotional axis was crossed at the two locations. The Clinton crowd registered tension, anxiousness, then shock and disbelief... And at Trump headquarters, the inverse was true: nonchalance, to interest, to amazement, to first pumping celebration." Hugh Hewitt: "I've never been this wrong." Hewitt had voted for Trump, but expected Clinton to win. On NBC, Chuck Todd assembled Hewitt and two other conservative commentators, Mike Murphy and Nicolle Wallace. "President Trump may be something that everybody needs to get used to, including the Republican Party," Todd said, "and I have to say here, here's three people, smart minds in the Republican party, and I think we all thought it couldn't happen." Back in the 7 p.m. hour, Jim Acosta had quoted on CNN a Trump aide saying it would take a "miracle" to win. Now, Acosta read aloud a followup text message: "Do you believe in miracles?" Clinton campaign sources clammed up. They mostly stopped replying to emails and texts from the beat reporters covering the campaign. Fox News had called Wisconsin, but the other networks were waiting, wanting more raw vote data. Still too early or too close to call: Michigan, Pennsylvania, Arizona, and Minnesota. "Her path is getting narrower and narrower," Jake Tapper said on CNN. Dana Bash said Democrats were already engaging in finger-pointing. John King was still counting votes at the magic wall. Ryan Grim: "There was certainly a shift in the energy of the newsroom, as people were slowly realizing that something historic was happening. ... It got really quiet." Politico publishes a story titled "How did everyone get it so wrong?" Michael Scherer: "There was this sense that the media had misread the election. I think that's true. We misread the outcome to some extent. But it's also true that Republicans had misread the outcome. And they're half our sources." Judy Woodruff: "I tried to be as careful as I could. Trying never to be getting ahead of what we knew." David Chalian: "It was like turning a battleship around. The narrative needed to be adjusted... You needed to follow these votes to get there, logically. John King at the wall is what turned the battleship around." The liberals on television who expected a celebratory evening looked distraught. On CNN, the panel of left and right commentators agreed on one point -- that there was real pain on both sides. Van Jones channeled the messages he was receiving. "I have Muslim friends who are texting me tonight saying 'Should I leave the country?' I have families of immigrants that are terrified tonight." Then Jones made his now-famous pronouncement that the election had been "a whitelash" against a changing country and a black president. Jones: "I also said it was a bunch of other stuff too, that it was revolt against the elites. I said that it as an overthrow of the pollsters. But I said it was a whitelash in part." On CNN, John King shows Clinton trailing across the rust belt states. "Wolf, if you're looking at this map and you're thinking 'Where can I squeeze some more Democratic votes to make up that,' my answer is I don't know. I don't see it." Newspapers held the presses and printed late editions. Annie Linskey's editors at the Globe went with "Suspense to the finish" as the banner headline. Linskey: "It felt completely odd and incongruous to be sitting in this Javits Center -- that was specifically chosen for the glass ceiling, a setting for the first female president -- reading madly through the text of the Trump-wins story." David Chalian: Inside CNN, "there were some emails back and forth about points to be hitting; what does a Trump administration look like; things like that. People were still stuck in the shock of a Clinton loss -- we needed to re-frame some of the conversations. Jeff was relentless about looking ahead -- not looking too much behind." The AP projects Trump as the winner in Pennsylvania, giving him 264 Electoral College votes and putting him within striking distance of the presidency. Steve Scully: "I was doing a live interview with Bob Cusack, editor-in-chief of The Hill... When Pennsylvania was called, we both said 'Donald J. Trump will be our 45th president.'" On Bloomberg, D.C. bureau chief Megan Murphy reacts to the AP call: "That is the race, frankly. There is no path forward for Hillary Clinton." The Huffington Post's Sam Stein publishes a story titled "America Has Done What Seemed Unthinkable. Donald Trump Is The Next President." HuffPost forecaster Natalie Jackson tweets: "Come on, this has been over for a while. Make the call, networks." But caution ruled the night. David Chalian: "We made that decision long in advance -- even if it was going to be a Clinton blowout -- we were not going to project that somebody will GET to 270. We were going to wait for somebody, based on our projections, to BE at 270." For newsrooms with print deadlines, the timing questions were tricky. Carolyn Ryan: "When would she concede? When would he come out?" The broadcast networks stay in special report mode longer than scheduled. On ABC, George Stephanopoulos said, "Donald Trump is closing in on what may be the biggest upset in American political history." John Dickerson: "There's this picture of me, like, during some 30-second break, trying to shovel in a hamburger." Kathleen Carroll: "There were people, not at the AP, who were letting their political knickers show. You just can't do that. You just damage your credibility and the organization's credibility and the profession's credibility." Clinton campaign chairman John Podesta addresses the crowd at the Javits Center: "Several states are too close to call, so we're not going to have anything more to say tonight." Abby D. Phillip: "That was shocking. It's over -- but he did not tell them that the race is over." Maria Elena Salinas: "As a woman and a mother, what I thought was, 'She's a woman and a mother. She can't come out. She crying. She's in shock.'" On CBS, Charlie Rose said, "it is a grand irony that we talked a lot about whether Trump would accept the results, and now the question is not that." Trump arrived at the Hilton. It was clear he was going to be projected the winner — but when? In the CNN control room, Sam Feist's phone rang. It was Trump campaign communications director Jason Miller. Feist: "What the Trump campaign wanted to know is when we thought we would call it. They were not trying to influence us to do something that we weren't ready to do, but they were pushing hard for information. My guess is that they didn't want him on stage if it looked like it was going to take a long time for us to project a winner. It was clear that he was going to win. It was NOT clear which state was going to put him over the top. So I wasn't able to give them a firm answer." The AP is ready to call it. The AP projects Trump will win Wisconsin, putting him over the 270 mark. The wire service tweets: "BREAKING: Donald Trump is elected president of the United States." Judy Woodruff reported the AP's projection on PBS. The Cook Political Report national editor Amy Walter, seated near Woodruff, called the result "the most unbelievable thing that any of us have seen in our lifetimes." Ryan Grim: "There was definitely a surreal feeling. Where you have crossed one plane into another. One part of life into another." Jason Miller called Sam Feist again. NBC's Kelly O'Donnell breaks the news that "Hillary Clinton has telephoned Donald Trump to concede this election." Fox News becomes the first TV network to project that Trump will be the president-elect. Bret Baier credits him with winning "the most unreal, surreal election we have ever seen." Chris Wallace looked across the studio, where one of the oversized screens said "TRUMP ELECTED PRESIDENT." Wallace: "I remember kind of shaking my head -- trying to wake myself up -- saying, 'Is this really happening?'" The Fox projection was shown on the screens inside Trump's party. The ballroom was filled with cheers. Sopan Deb: "It was a room full of gob smacked people. Not just reporters. Campaign staffers. Trump supporters. A lot of people." Vice President-elect Mike Pence introduces Trump, and the president-elect walks on stage. On CNN, Wolf Blitzer made it official. "We can now project the winner of the presidential race. CNN projects Donald Trump wins the presidency." John Dickerson: "When I interviewed him in January of 2016, he said, 'I'll be a much different kind of president than I am a candidate.' So I thought, 'OK, this is the first act of the Trump presidency. This is the first moment." David Hume Kennerly was right in front of the stage, photographing Trump's speech. Hume Kennerly: "It was still hard to believe, watching it happen. I had fully expected to be covering the loser." Annie Linskey was walking back to her hotel in Times Square. Linskey: "These TVs were on in the windows of buildings. Trump was speaking. A dozen people must have been standing there watching around me. And there was just silence. People were just stunned." Hume Kennerly: "I thought it was a remarkably subdued speech. It was almost like a Trump hotel opening." NBC and ABC formally call the race while Trump is speaking. As Trump concluded, George Stephanopoulos said "he has triumphed, proving all the doubters wrong." On MSNBC, Nicolle Wallace said: "Trump took down the Democratic party and the Republican party tonight." The New York Post unveils a new front page. The headline: "They said it couldn't happen." Some of the commentators on television looked and sounded stunned. On CBS, Scott Pelley went to Bob Schieffer, and Schieffer said, "You know, I remember when Richard Nixon resigned, and CBS News correspondent Roger Mudd was part of the panel after that happened. They said, 'Roger, what's your reaction?' And he said, 'You know, I think I want to go home and sleep for a couple hours, and I'll come back and tell you tomorrow.'" Gayle King, seated next to Schieffer, laughed knowingly. "This is historic," Schieffer said. "But I don't think we can say right now where this goes from here." Maria Elena Salinas: "It wasn't until after the broadcast ended that we all said, "What just happened?'" Judy Woodruff: "History played out in real time." David Chalian joined the CNN team at the main anchor desk for the end of the ten-hour special report. After Blitzer signed off -- "This has been a truly historic night. Trump elected President of the United States" -- there was "a complete and utter exhale" in the studio. Chalian: "I recall people saying to each other, 'This is going to be one of the greatest stories of our lifetime.'" Reporters and anchors took naps. Kathleen Carroll: At the AP and other newsrooms, new shifts of workers took over early Wednesday morning. "There were still races to call." Carolyn Ryan: "I went home at 5:30. I came back at 8:30, and we had six stories planned for the new Trump reality." Michael Scherer: "It was one of those things you don't see coming, and then once it happens, it makes total sense. How else could you end an election like that?" Maria Elena Salinas: "We had backlash from viewers right away, saying we fooled them, we lied to them, telling them Clinton was going to win." Kathleen Carroll: "There was so much presumption that the media failure was a failure to predict it. That's not what the job is. The job is not to predict it. The voters get to choose. Let's let them vote and see what happens." Judy Woodruff: "Don't make assumptions. Don't make assumptions. We know that already, and we live by that creed, but you just have to be prepared all the time for events to take you in another direction. And be humble about it." Scherer: "The wonderful thing about democracy is that we don't decide. The voters decide." Sourcing note: Most of the interviews for this story were conducted by phone. Van Jones was interviewed on CNN's "Reliable Sources." Dana Bash and Amanda Carpenter were interviewed on stage as part of a panel discussion. Times are approximate except where noted.